LeanPath supplied data for this new study and reviewed the results before publishing. These food service operators made a range of investments in food waste reduction programs, including purchasing smart scales--including LeanPath technology--training staff in measurement and techniques to reduce waste, and redesigning menus. Seventy-nine percent of sites were able to keep their total investment in food waste reduction below $10,000. “We’ve long known that contract catering struggles with food waste,” said LeanPath CEO Andrew Shakman. “This report illustrates that opportunity, as well as the immense opportunity to drive change and save significant financial resources. Most of this change is enabled via daily measurement of food waste, which changes the kitchen culture. LeanPath is proud to be the pioneer in food waste prevention for this market and we know our automated tools have made a fundamental shift in behavior possible." For more information, read the full report here. 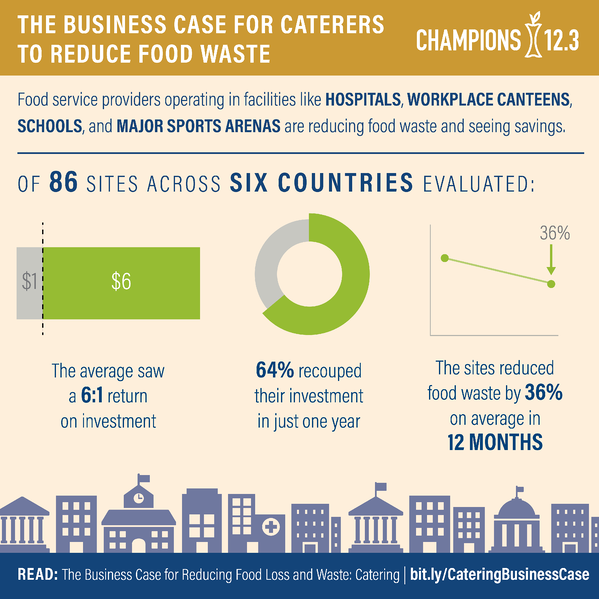 This report is the follow up from The Business Case for Reducing Food Loss and Waste (published March 2017), and is the second in a series of papers examining the business case for specific industries. An analysis of the hotel industry was released in April 2018, and an analysis on the restaurant industry will be released soon.